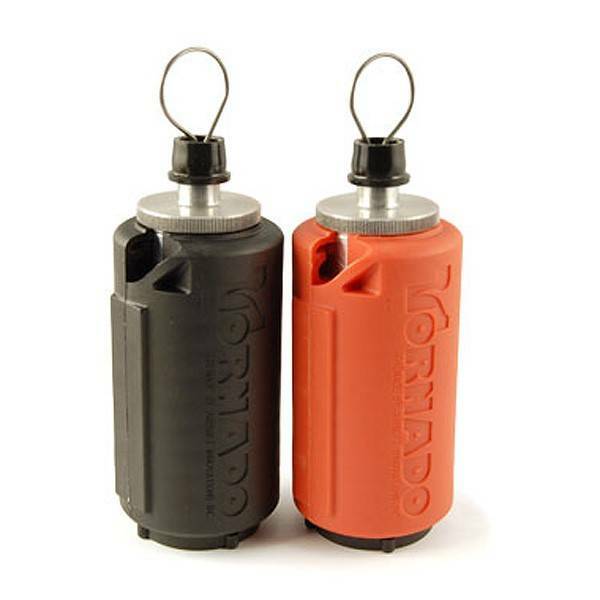 Add the Tornado Impact to your arsenal of Tornado Timer Grenades. The Impact grenade explodes on impact, compared to the Timer grenade that offers set back times of 1.5 or 3 seconds. The Impact Tornado explodes immediately once it hits a hard surface - from as little as one inch away on concrete, but will hold - even with the pin pulled - when you shake it aggressively in your hand! Triggers at one inch drop to floor! Propane (Green Gas) powered / Can be configured for HFC134a too.! Completely re-usable. Just reload bbs and gas! Full 3D (360°)coverage. Not a shotgun blast or a disc distribution. A full spherical scatter! Consistent 3 second timer with optional 1.5s delay for airburst or short ground throws. Give your opponents no time to react! Tough design survives gazillions of throws! We don't know how many blasts to failure, but we'll keep counting. No loose parts to lose. Keep track of the pull pin though. Easy to quickly render safe for safezone handling.